Walter R. Brooks (1886-1958) is remembered today as the author of the Freddy the Pig children’s books. But from 1915 through the late 1940s, he was also a prolific writer of almost 200 adult short stories for popular magazines like The Saturday Evening Post, Colliers, and Esquire. Among those short stories were the series of humorous fantasies about the talking horse Mr. Ed and his often-drunken owner Wilbur Pope. There were 23 of these between 1937 and 1945, for Liberty, Esquire, The Saturday Evening Post, and Argosy. (Plus two more unsold stories included in the 1963 collection.) Brooks eventually stopped writing anything besides a yearly Freddy the Pig novel, illustrated by Kurt Wiese. The Freddy novels came to be eagerly anticipated annually by children’s librarians and young readers, while Brooks’ earlier magazine short stories were forgotten. Just before Brooks’ death in August 1958, Arthur Lubin, a fledgling television producer fresh from his success as the director of most of the Francis, the Talking Mule movies for Universal Studios during the 1950s, licensed from him the rights to the Mr. Ed series as Lubin’s first TV program. There was also a connection between the Francis movies and the Mister Ed TV series in that Lubin employed the same animal trainer, Lester Hilton. It took three years, but Lubin and the Filmways Television Productions company sold the concept to sponsor Studebaker Corporation for TV syndication in January 1961, and then to CBS for network broadcast in October. Mister Ed, starring Alan Young as a bumbling young architect and a golden palomino gelding named Bamboo Harvester as the talking horse, was an extremely popular TV comedy for six seasons from 1961 through 1966, and in reruns and DVD sales since then. Brooks’ original mildly bawdy humor, emphasizing Wilbur’s and Mr. Ed’s comedic drunkenness and Ed’s earthiness, was toned down considerably for the family TV audience. Bantam Books (NYC), January 1963, paperback 118 pages, USD 40¢. Illustrated by Bob Bugg. There were other changes between Brooks’ stories and the TV sitcom. Wilbur Pope became Wilbur Post. Wilbur as played by Alan Young became a successful young architect; a likeable but ineffectual nerd. The TV Wilbur was self-employed, with his office in his Southern California suburban house’s modern barn. Brooks’ Wilbur was considerably older and less loveable, living in NYC’s “bedroom community” of Mt. Kisco, NY, and was just one of several architects employed by a big NYC firm; Lamson, Camphire, Leatherbee & Wallet. (In some stories it was an advertising agency and Wilbur was an advertising account executive.) Wilbur’s lively socialite wife Carlotta, who liked to host crowded cocktail parties and invite former boyfriends to them, became sitcom meek housewife Carol, because Carlotta was felt to sound too foreign and racy for Americans. According to biographer Michael Cart in his 2009 Talking Animals and Others; The Life and Work of Walter R. Brooks, Creator of Freddy the Pig, Brooks’ widow Dorothy claimed that in 1942 the Saturday Evening Post’s editors felt that Wilbur and Mr. Ed had become too drunken for a family magazine, and instructed Brooks to have them go teetotal. Brooks’ response was to move the series to Argosy, where one of his first stories satirized the temperance movement. 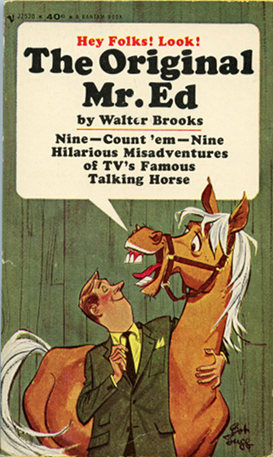 The TV executives may have considered this book to be merely one of a multitude of merchandising items, but Cart says that it was actually a project of Brooks’ lifelong best friend, Francis Rufus Bellamy, to get a Mr. Ed collection published, and as a benefit to get some money for Dorothy Brooks. The two also took the opportunity to get two of Brooks’ four unpublished Mr. Ed stories into print. The nine stories each have a full-page line-drawing by Bob Bugg, whose cover shows his art style. Ed predicts that the spoiled, predatory Wilma “Exercise never hurt anybody” Kirby has decided that she wants Wilbur, and he will just have to divorce Carlotta and marry her. Wilbur is aghast when this turns out to be true, and Carlotta nobly proclaims that she will not stand in their way. Does Wilbur really love Carlotta, or is it just that they have a comfortable relationship together? She mostly ignores him to live as he wants, whereas Wilma would “improve” him into exhaustion. Ed determines that the one thing that Wilma’s politician-father is afraid of is a big, embarrassing public scandal, so he makes it look like the Popes are about to involve him in one and he drags Wilma away. Problem solved, to Ed’s and Wilbur’s relief. In “The Midnight Ride of Mr. Ed”, Carlotta’s man-hating trustee Aunt Edith threatens to cut off Carlotta’s independent large allowance if she doesn’t divorce Wilbur. She refuses, but they can see that this would force Wilbur to support Carlotta in the style to which she has become accustomed, which he would be hard-pressed to do. The idea almost backfires and gets Wilbur committed as insane, but Ed manages to throw the suspicion on Aunt Edith in such a manner that Wilbur can blackmail her into leaving Carlotta’s trust alone. “His Royal Harness” is one of the two “new” stories that were rejected during Brooks’ lifetime. If Cart hadn’t said so, I never would have known; it’s no better nor worse than the others. The Popes have a cousin’s family as house guests, including two little girls. Ed is usually cautious to not let anyone besides Wilbur know that he can talk, but he figures that no adult will believe two young children so he entertains them with tales of being an enchanted prince. But their mother is one of these strict modern women who won’t distinguish between fairy tales and deliberate falsehoods, and their repetitions of Ed’s stories about King Jumbo VIII and his magic kingdom get little Jean and Silvie severely punished for lying. Ed has to work his “magic” on Mrs. Hubbard to get the girls excused. Ed later amuses Wilbur with racier tales about King Hoopla XIV and his harem of concubines. Great post! I'm a member of the Friends of Freddy club, a group that focuses on the Freddy the Pig books. This is a great summary of the Mr. Ed stories. Thank you! You're welcome to point other members to this review if they'd be interested, or print off a few copies (unless Fred objects). Thanks for this! I got to read most of the Liberty and Saturday Evening Post Ed stories in our library a while back---great fun! Thanks for reminding me of this review and of the "Mr. Ed" stories three years later. 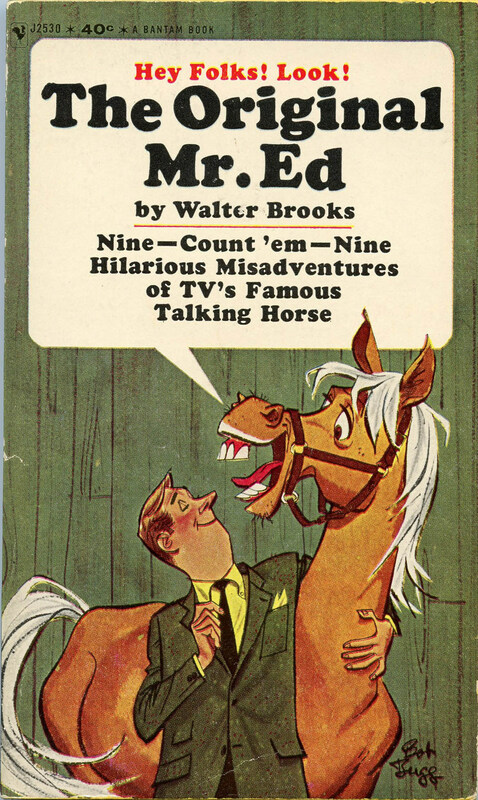 Although I haven't changed my opinion that a complete collection of all 25 "Mr. Ed" stories -- or 27, if the last two unpublished stories are still available today -- would become too monotonous, it nevertheless seems a shame that most of them have never been reprinted and have to be tracked down in 75-year-old magazines today. Could there be any correlation between these this Mr Ed character and the great trotter Greyhound, of that era?? Greyhound raced between 1934 and 1940 and set 23 world Records incl. The Hambletonian in 1938.Youtube has several Movietone films of his races. It was said "the faster he became the whiter he became", until he was absolutely snowy white. (I'm actually writing a book on Greyhound who is buried here in St Charles Illinois.) The coincidences are stunning. Greyhound's stall & barn on Flanery Farm in Maple Park , IL was nearly identical to the later tv characterization of Mr Ed. Your thoughts, anyone? No offense, but I think that this is a bit of a stretch, especially for the magazine stories of the late 1930s-early 1940s. Horse stalls and barns were still fairly common then, and the real stalls were pretty generic. The TV episodes presumably used photos and maybe newsreels as set references, and may have used some of Greyhound and his stall since they were apparently prolific and easy to come by. Not following your thoughts here please do explain "magazine stories"? You must be unfamiliar with Greyhound- a structure such as Greyhound's stall was never before built, and has never been seen since. No matter the "royalty", no owner ever built such a home for his horse, and it is unusual that his owner a became so close. Greyhound was among upwards of 60 horses in E.J. Baker's Hotel Baker Stable, but he was, "The Horse". A pet E.J. visited three or more times a week, his caretakers lived in the BACK apartment-also unheard of. It was 1940 when he took retirement,pine- paneled stall was air conditioned,recessed lighting, a large picture window for him to visit w/ over 30,000 guests who signed his guestbook 1940 until his death in 1965. The'receiving room" was outfitted w/ an easy chair where his caretaker, Dooley Putnam sat,at the window. There was a sofa,more chairs & end tables with coach lights, a trophy case and famed art and photos, the floor was carpeted. No horse in any part of the U.S. or the world had such a barn and stall.These stories were written paralell to his career. There is another short story in The Original Mr. Ed paperback book that is not on your complete list. It is “Ed Takes the Brush in his Teeth." I list this as one of the stories in the paperback. I assume that it is one of the 25 magazine stories retitled, but I don't know which one without having the magazine stories to compare it to. Today, January 2018, is almost the 70th anniversary of Walter Brooks' death in August 1958. If I understand correctly, copyrights extend for the life of the author + 70 years. That would mean that anyone would be able to publish a complete collection of all the Mr. Ed stories without needing copyright permission after this August. Is anyone interested? 1958 was 60 years ago. They'll have to wait another 10 years, and that's assuming the "Mickey Mouse" copyright term doesn't get further extended. It's not that simple. It depends where. US and Europe is mostly 70 years after the death of the author. South Africa and many countries in Africa and Asia have it to 50 years after the death of the author. Central and South America tend to longer times and other ones in Africa can be shorter.